Sam was the second eldest in our family of six children. He was always creative and artistic, often making costumes for us and writing characters for us girls to play. (We were 3 girls and 3 boys). He played the guitar and sang in a band at school and all the girls thought he was gorgeous. He used to talk of how one day he’d get married and have a big bunch of kids. He was very interested in our Maori heritage and took a trip up to Northland one time. I still remember his enthusiasm as he told of what he had learned of Maoritanga. Sam was a keen gymnast and played tennis as a youth but perhaps his greatest love was for dogs. He owned a series of different dogs up until within a few years of his passing. His enthusiasm for life spilt over into all the activities he embraced, and when he set off to live in Sydney he kept his family up to date with his adventures with regular letters and visited home whenever he could. (Sam was widely travelled, having toured a lot of Europe, England and the United States. However, he made Sydney his home, becoming nationalised and making firm friends there, where he could live openly as a gay man without the fear of repercussions in his home country, as was understandable in those days before the hard-won level of acceptance enjoyed by today’s gay community in NZ had even begun. It was some years before anyone in the family found out that Sam was Gay. It explained a lot of vague mysteries. My sisters and brother each visited with him in Sydney, and I looked forward to the day that I could visit on a more regular basis, however it wasn’t to be. We received the news by phone one day that our brother had an incurable disease of the immune system. Sam was one of the first diagnosed with AIDS in Australia. On visiting him in the hospital in Sydney, (as did our father sisters and brother) he was being experimented on with the early drugs, and we were given a set of rules in the hospital. (For example, we were given masks and gowns to put on and advised not to touch him. His food was left outside the door by the hospital kitchen staff.) I for one ignored this and delighted in giving him a back massage, after which he enjoyed the first restful sleep in some time. Sam finally declined any further treatment and went home, to ‘buy a new wardrobe’ and try to live as normally as he could. ‘Home’ by then was with his good friends who stood by him and cared for him until he died. Our mother, Joan, terrified of aeroplanes and never having flown before his illness, braved the trip to Sydney a second time, accompanied by our brother, Darryl, to be with Sam as he was dying. Mum later appeared in a program about AIDS on T.V., which first introduced the famous Eve to NZ, again bravely as the producers could find no other mother of an AIDS patient to appear until they contacted her. Mum will always be grateful for the fantastic support she received from the gay community in Wellington, and still rings some friends, and receives invitations to special events. People who’d known Sam, and old friends from school days also contacted her when they heard of his death. Thanks, everyone. Following Sam’s death and a memorial service held in Auckland, we heard about the Quilt project and as we three sisters all live in Auckland we got together to think of the idea for a quilt to commemorate Sam. He was an artist selling many of his paintings and screenprints in Sydney, and one of these had been a print of the Sydney Harbour Bridge with the full moon rising behind it. We felt it appropriate to honour him in the place he had chosen to live. Linda’s son Brendan, an artist also, drew the picture, copying from Sam’s print, and Linda, Paula and I cut and appliqued the quilt. It was still unfinished when we submitted it to be included with the first exhibition of the Quilt project, and remains unfinished today. Our mother (an expert sewer herself) wants to add her touches at some stage. 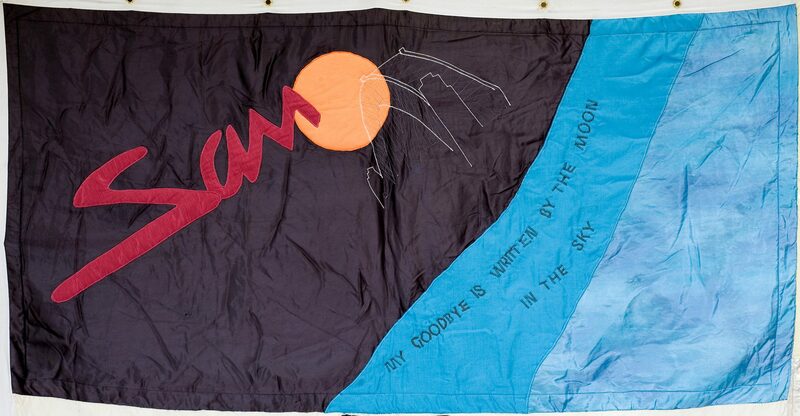 The wording on the quilt is taken from a song by Bette Midler, a favourite of Sam’s, and are words he chose as his goodbye message to his family and friends. We dedicate our quilt in the memory of Sam and all those taken by AIDS and their families.